So, I decided to follow Kate Gilbert on her two-week sweater challenge (she had to knit up a sample sweater in two weeks for a Twist Collective photo shoot deadline). And between that and work and the kids' school years coming to an end, I haven't had time to blog. I've had three hanks of Louet Euroflax in my stash since ... 2007? 2006? Quite some time, anyway, and those skeins had fully matured. Originally I had planned to knit the Lacy Skirt with Bows by Kat Coyle out of that yarn, but when I'd swatched on US4s, I actually broke one of my Bryspun needles (they are plastic, so it happens, especially when working with such an inflexible yarn). 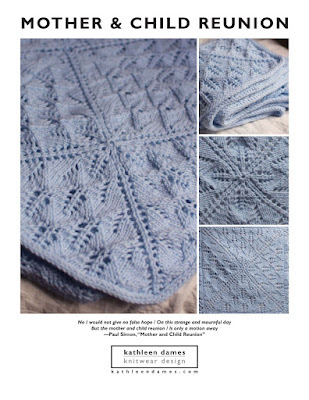 But I'd come around to the idea of a sweater (and Kat's skirt is still in my queue awaiting the appropriate yarn - love the combination of lace and ribbon) with this linen yarn, at a larger gauge. With US8 aluminum HiyaHiya needles, I cast on my idea for a drawstring-neck sweater (the sleeve to be precise), and away we went. Because the linen produces such a drapey fabric, I decided not to include any shaping in this one, so it's really just three straight tubes (in two different circumferences) with eyelets thrown in here and there for drawstrings and raglan lines. I fell for the picot point cast-off recently while swatching for another project and decided they would add the perfect feminine touch to the edges of this sweater, as well as add a little extra weight to the hem. Right now I have i-cords for the drawstrings but may need to find some pretty ribbon instead. Here's a quick shot on me. I had just finished the i-cords, so this is pre-blocking, and I hadn't woven in the ends yet. Though the body and one sleeve are washed, the other sleeve, body hem, and yoke were unwashed and still very ... crinkly. What interested me most was the change in the fabric after washing and drying in the machine (love the low-maintenance sweater! ), which you can see in the pictures: one sleeve and the yoke are straight off the skein and the body and other sleeve have been through the machine once. I got a little nervous at one point and decided to wash what I'd knit to make sure my calculations were correct. Now, it wasn't so much that the gauge changed (it did, but only slightly), it's that the fabric completely changed, plumped up, in fact, and smoothed out. The other interesting thing I learned about linen yarn in my obsessive Ravelry research, knitting, and shopping (J.Crew has a pretty, "dip-dyed" linen sweater) is that this yarn in a stockinette fabric biases a lot. That J.Crew sweater? It was knit up in pieces and seamed; when I tried it on, one of the seams ended up swinging itself across half my torso. Not flattering to this mummy tummy. So, beware the bias, or just embrace it. The little picots at the bottom of the sweater give a little weight to the hem, helping the drape of the fabric. So pretty and feminine! Can't wait to see the final pics. Love the color of blue. i've been crocheting a dress with euroflax linen. it's really hard on my hands. it's much easier to work with at a loose gauge.